In the 4th Game outside Coors Field; the Four-Seamer killed the Rockies' game once again. In this game, Ryu and the Bull-Pen threw 30 strikes and the Rockies got a miserable 1 hit off that pitch. The VMI for the Rockies is now up to a plus 1.30, which tells me that the movement is not far from what they are now used to seeing. The Rockies "double-digited" the Curve and the Cutter, so it was wise of the Dodgers to avoid more "Loose" pitching than they did. Above is the info on the 3rd game of this series. The second inning of this game was the Giant killer and it came from the Rockies' pitcher on an 87 mph Cutter. Story flied out on a 4-seamer to start the inning and Arenado did the same to end it, Cargo hit a 4-seamer for an error, but all the hits came off the 2-seamer and the cutter. Desmond got a 2-seamer, Ianetta walked and the pitcher (after missing several 4-seamers) did the damage on an ill advised cutter. Blackmon walked, LeMahieu hit a sac fly on a cutter for the 3rd score of the inning. 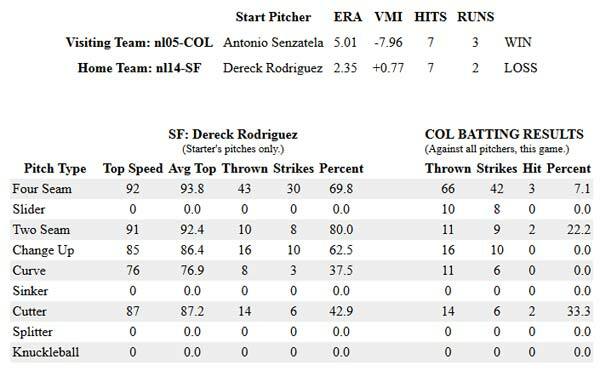 The Giants could have won this game, as the Rockies hit only 7.1% of the Four-Seamer strikes productively. However the Rockies "Double-Digited" the Two-Seamer and the Cutter. In the 2nd game of the series, Bumgarner threw the 2-Seamer by the Rockies, but not so much the Cutter, Slider and Curve. The Bull-Pen threw the 4-Seamer by the Rox. The hits on the Slider, Curve and Cutter presented in over 70 ADI, are indicators of talent, but the lack of hits on the 91 mph 2-Seamer is an indication of visual memory not matching muscle memory. The 2-Seamer lifts less than the 4-seamer, but slides more than the 4-seamer. The Rockies as well as the balance of the league have a substantially higher rate of hits per strike presented on the 2-seamer, so if the Coors Field effect were not in play, the Rockies most likley would have hit the lesser moving 2-seamer. Further indications of visual memory as opposed to physiological weakness issues are evidenced by the speed and movement of the Cutter. The Rockies got 3 hits off the 88 mph Cutter, so their bat speed must be up to normal in order to make that in flight adjustment. Watch out for the Rockies as they transition to the lesser movement venues of LA and then to Arizona, because they will probably start hitting the 2-seam and 4-seam much better in the 3rd and 4th games of the road trip, before they become more fully adjusted to "Normal" baseball. Case in point regarding the Physiology and/or talent level of Colorado players competing in MLB. As I have mentioned in several articles, the owner of the Colorado Rockies has stated that the reason the Rockies' statistics trend downward during a home stand of six games or more is that his players lose oxygen level and therefore strength and stamina by the last game in Colorado. Furthermore, he has stated that he has a Colorado University Health Center physiologist who has confirmed that electrolites are the issue. If that were the case, then cannot electrolites be controlled? Furthermore, this is the end of the season and the Rockies have been winning both at home and on the road, so their mental health should be at a peak. In the Rox last home stand their hits per game have totalled the following numbers: 11, 10, 7, 10, 7, 8, 17, 9, 13, 16, which do not show any substantiated drop-off throughout the stand. However, when the Rockies left Coors Field yesterday to compete in substantial air density and proven good movement in San Francisco, their hits totaled 2 for the entire game. Their team talent has been proven both at home and on the road this year, so it is not just at Coors Field where they excel. When teams throw the four-seam fastball to the Rockies first leaving Coors Field, the Rox have gotten a hit on only 6.18% of the strikes presented. Yet, they have hit the downward breaking slider at a clip of 10.71% indicating their strength and stamina is not the issue, but their mechanical setup for each type of pitch. Yesterday, in San Francisco, they hit a whopping total of 1 four-seam fastball for a 2.8% ratio against 36 strikes presented. 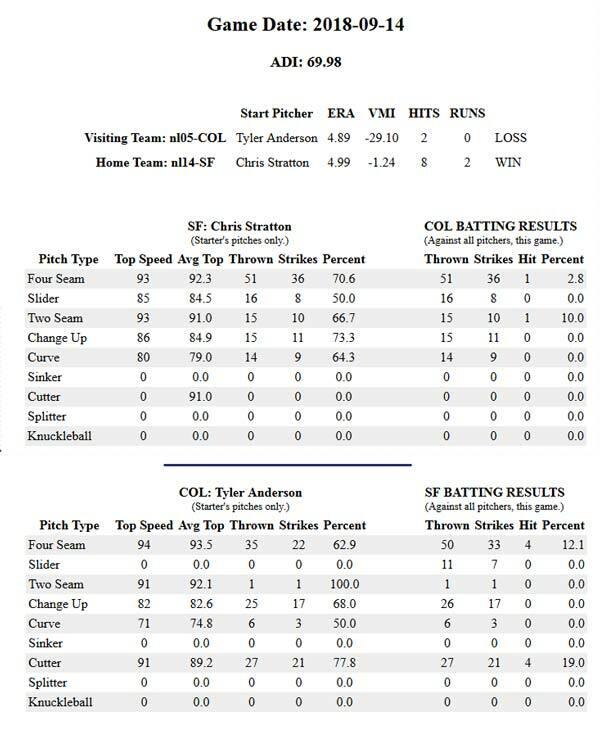 Since the balance of the league also shows these same tendencies after leaving Colorado's Coors Field having played 3 games or more and arriving at another MLB venue, then these stats should be noted and accounted for by the league and the Hall of Fame committee when considering players' data.